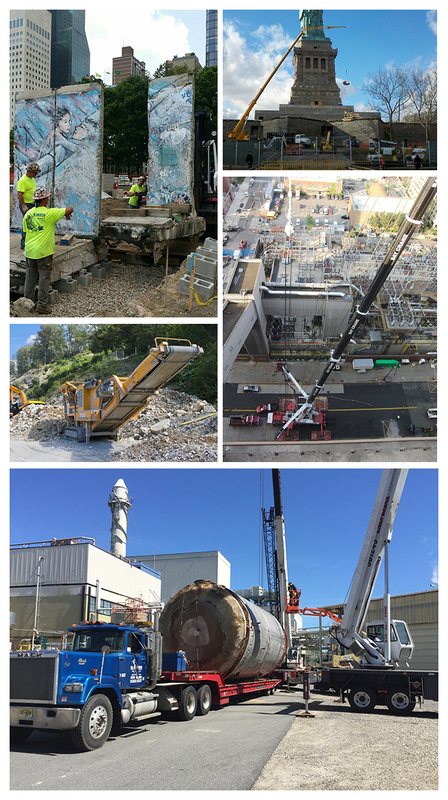 R. Baker & Son All Industrial Services, Inc. performed the decommissioning and dismantling of four (4) gunite lined steel stacks from the top of PSEG’s Glenmont, New York Powerhouse. The 20 ft diameter, 170ft tall stacks sat on top of the 165 ft high building roof for a total height from the ground of 335 ft.
R. Baker & Son All Industrial Services, Inc. was chosen by PSEG to perform this work based on the complexity of this project and R. Baker & Son’s multiple in-house capabilities and its ability to perform a total turn key project. Tasks involved cleaning and remediation of over 1000 cu yds of fly ash from the stack bases and breeching. Rigging and dismantling procedures involving detailed lift plans, weight calculations, monitoring weather conditions and wind loads, confirming ground stability and a number of other critical factors to guarantee that all lifts were safely performed. Material management was very important including segregation of fly ash, gunite and carbon steel for recycling. 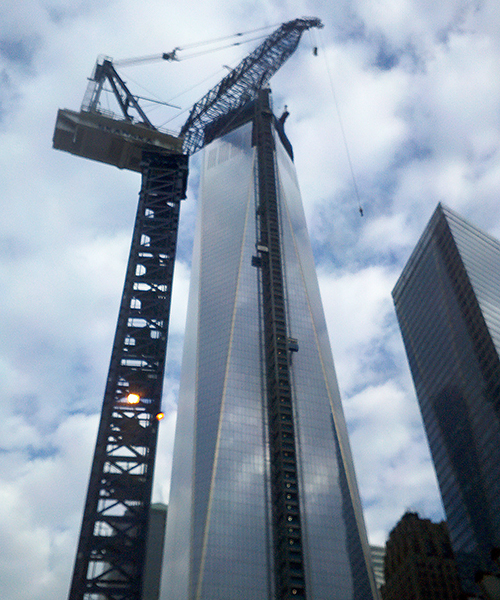 One of the largest obstacles to overcome was the type of crane to be utilized due to a confined footprint for which to assemble equipment and which was surrounded by live power lines, cooling towers and a new powerhouse which remained on line 24/7. R. Baker & Son working together with PSEG Engineering and Lomma Crane decided to utilize a M760 ton Favco tower crane erected on top of the powerhouse to be utilized for the lifting and lowering to ground of stack sections. R. Baker & Son erected and installed a base for the Favco tower crane and tied it directly into the building’s column lines. 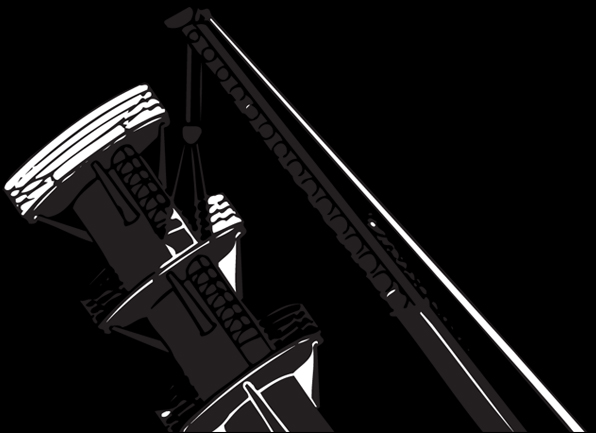 A 500 ton hydraulic Demag was utilized to hoist workers in a certified man basket over 350 ft. in the air in order to perform rigging and dismantling activities. R. Baker & Son standard operating procedures called for daily tailgate safety meetings along with documented weekly safety meetings. R. Baker & Son utilized JSA (Job Safety Analysis) Reports and Daily Task Analysis Cards. The on-site Health & Safety Manager performed daily inspection rounds. Weekly inspections were required and conducted by Project/Construction Manager. Periodic safety auditing were conducted by R. Baker & Son’s corporate Health & Safety Officer including but not limited to employee interviews, on-site equipment condition inspections and random drug testing. R. Baker & Son supplied fully trained and qualified personnel to meet and exceed the project requirements. R. Baker & Son crews were made up of a composite of safety professionals, Hazmat trained and certified industrial dismantlers and ironworkers, master riggers, expert heavy equipment operators and demolition superintendents who are dedicated to their craft. All metals generated by this dismantling project were separated and shipped to the appropriate recycler. R. Baker & Son handles over twenty thousand tons of scrap per year affording us the opportunity to command the greatest value per ton available in the market place. This purchasing power along with our 60 year presence in the market place should prove beneficial results in providing greater scrap revenue credits which are passed on to the customer to offset project costs. 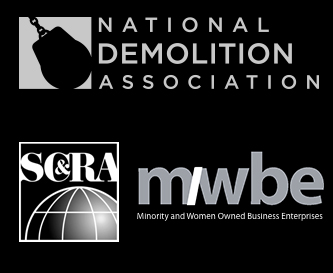 R. Baker & Son is a proud member of the National Association of Demolition Contractors (NADC), the Investment Recovery Association (IRA) and the Specialized Carriers & Riggers Association (SCRA) which brings us in contact with the majority of Fortune 500 companies and investment recovery departments, along with numerous surplus equipment vendors. R. Baker & Son takes great pride in completing this strictly regulated and potentially hazardous project on schedule and most importantly incident free.